TULSA, Okla. -- Baylor finally subdued the upstart USC Trojans. The third-seeded Bears overcame a four-point deficit late in the second half and ousted 11th-seeded USC 82-78 in second-round NCAA Tournament East Region action Sunday night at the BOK Center. Guard Manu Lecomte scored eight straight points to take the Bears from a two-point hole to a six-point lead with 3:55 left, and Baylor held on. The Bears (27-7) advance to the Sweet 16 to face the Duke-South Carolina winner in a regional semifinal on Friday at Madison Square Garden in New York. Forwards Johnathan Motley and Terry Maston each scored 19 points to lead Baylor. Lecomte scored all 12 of his points in the last five minutes. USC forward Chimezie Metu scored 28 points to lead the Trojans, forward Bennie Boatwright added 16 and guard Elijah Stewart had 12. USC grabbed its first lead of the second half when Stewart hit a 3-pointer for a 53-52 edge. On the Trojans' next trip down the floor, Stewart drove baseline for a dunk, was fouled and completed a 3-point play for a four-point edge with 9:48 remaining. Baylor's situation got worse a couple of minutes later when Motley picked up his fourth foul with 8:16 remaining. Motley fouled Metu going toward the rim and Metu hit two free throws to put the Trojans ahead 60-56. 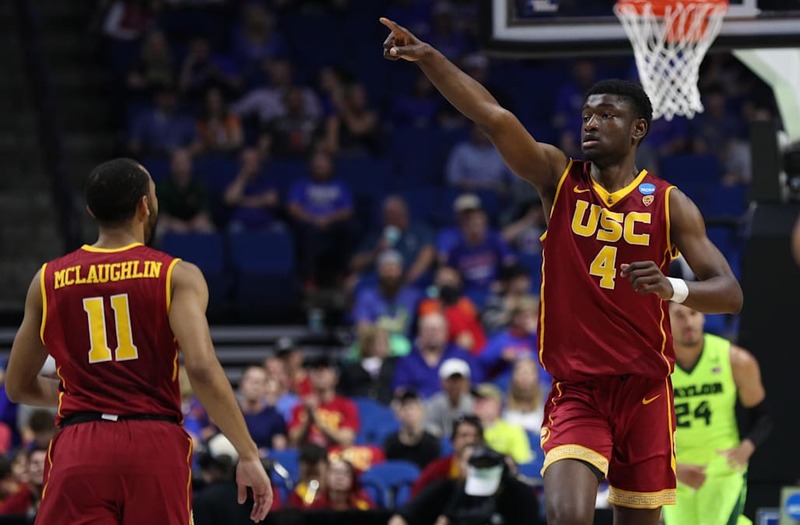 USC (26-10), which defeated Providence in the First Four on Wednesday and sixth-seeded SMU on Friday, appeared to be on the verge of winning three games to get to the Sweet 16. But that's when Lecomte took over for Baylor. He hit a 3-pointer, was fouled and completed a 4-point play with 4:40 left to kick start his surge down the stretch. Baylor stretched out its largest lead of the first half to 10 points when Lual-Acuil threw down a dunk on a pick-and-roll assist from Lecomte with 2:08 to go before halftime. But USC bounced back to cut that margin in half before the break as forward Chimezie Metu scored five straight points. Mets completed a 3-point play with 1:30 left in the half and then added a jumper a minute later. Boatwright paced USC in the first half with eight points and Metu added seven. McClure led Baylor with 14 points in the first 20 minutes as he hit 4 of 7 from 3-point range. Baylor dominated the rebounding category, 21-12, in the first half. The Bears had 10 offensive rebounds and scored 18 points in the paint in that period. NOTES: Baylor and USC were facing each other for the first time since 1976 and the third time in series history, all of which have been played at neutral sites. The Bears and Trojans split two previous meetings. ... USC set a school record for wins in a season by defeating SMU in the first round on Friday. Previously, the Trojans' single-season wins record was 25 in the 2007 campaign. ... Baylor has a 4-0 record in second-round games since the tournament expanded to 64 teams in 1985. The Bears won second-round games to reach the Sweet 16 in 2010, 2012 and 2014 and now 2017.